Does the Bride Pay for the Bridesmaids' Dresses? Are Wedding Expenses Tax Deductible? Who Pays for Bridesmaid Dresses? 1 Does the Bride Pay for the Bridesmaids' Dresses? Being chosen as a bridesmaid for a friend's wedding is an honor, but it comes with expenses, responsibilities and questions. One of the most commonly asked questions from bridal attendants is "Who pays for the bridesmaid dresses?" Traditionally, bridesmaids are responsible for the cost of their bridesmaid dress. 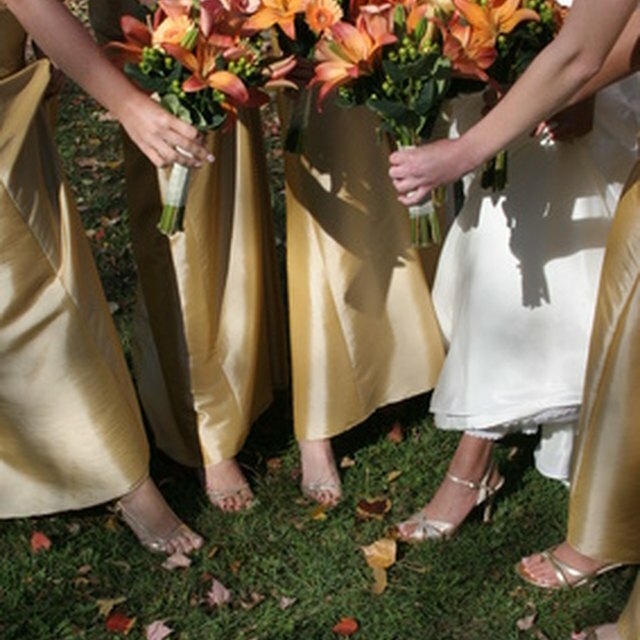 Each bridesmaid also traditionally bears the expense of her shoes, jewelry, hair and makeup. According to a survey conducted by Discover Card in 2007, the typical bridesmaid spends $963 on the varied expenses associated with a wedding. She pays about $200 for the bridesmaid dress. In newspaper interviews and in her Miss Manners column, Judith Martin has stated a bride should be considerate of her attendants' financial circumstances when choosing bridesmaid dresses. As it has become more acceptable for bridesmaids to wear nonmatching dresses, many brides opt to have their attendants choose their own dresses instead of requiring them to pay for an expensive dress they might never wear again. Some brides choose to pay for their bridesmaids' dresses, but it is neither traditional nor expected. What Does Couture Mean in the Fashion World? Does the Mother of the Groom Get Invited to All Wedding Showers?